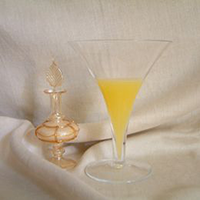 Boxcutters, Jigger, Shaker Classic/Boston, Citrus Juicer, Strainer, Tablespoons, Martini Glass. Fill a cocktail shaker with ice and pour in the ingredients. Shake well and strain into a Martini Glass.